CBS and Turner may own exclusive broadcast rights to the NCAA basketball tournament, but ESPN is pulling in March Madness-crazed fans on mobile devices. New research from NPD shows the cable sports network was the most popular mobile site among Android smartphone users during the first week of the tournament, with reach of nearly 4% in the sports category. The NCAA mobile site was a distant second with less than 1% reach, followed by Yahoo Sports, with less than 0.5%. On the app side, NPD found that more general-purpose apps, like ESPN Score Center, CBS Sports and ScoreMobile, were among the top performers during the first week of the tournament. “But we also saw some NCAA Championship tournament-specific apps, such as ESPN Bracket Bound and NCAA March Madness Live, rise to the top,” noted Linda Barrabee, research director, NPD Connected Intelligence, in a blog post Monday. She suggested that uptake of the paid version of the March Madness Live app ($3.99) for Android phones may have been undermined by difficulty streaming video in older versions of the operating system. “While Google Play (formerly Android Market), indicates app support for Android 2.2 and up, there have been reported app-support problems with devices in that OS mix -- some of which may have contributed to the limited reach figures seen during this Week 1,” she wrote. The data is based on NPD’s Connected Intelligence SmartMeter, which tracks consumers' use of smartphone apps, Web sites, communications and content services. The SmartMeter, which relies on an opt-in panel of users, does not yet include tracking on iPhones. 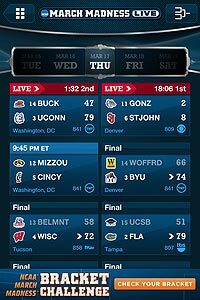 Separate findings released by comScore on Friday showed that smartphones and tablets accounted for about 20% of the Web traffic for first-round tournament games played March 15 and 16. Sports-related traffic on March 15 on tablets increased 94%, and on smartphones, 83%, compared to the average of the prior three Thursdays. NPD plans to continue tracking mobile usage during the entire NCAA tournament and release research results spanning the three-week period.